In the LITA Blog Transmission featuring yours truly I fumbled in trying to explain a time logging feature in the Windows native program Notepad. You can see in the screenshot above that the syntax is .LOG and you put it at the top of the file. Then every time you open the file it adds a time stamp at the end of the file and places the cursor there so you can begin writing. 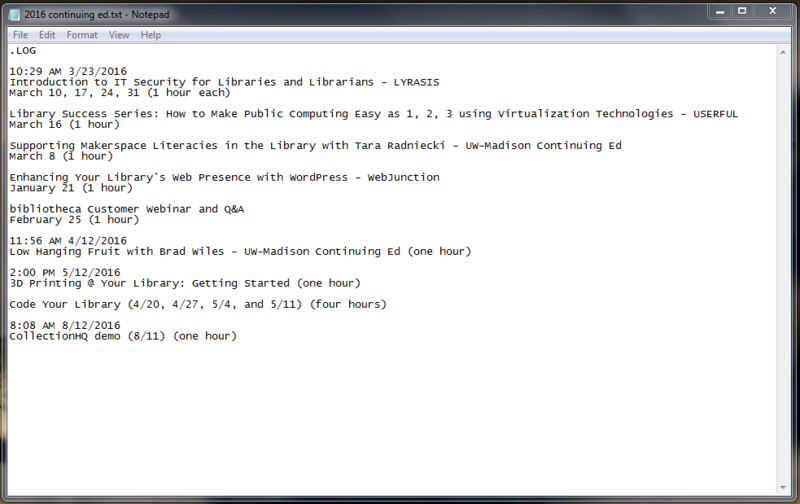 This specific file is where I keep track of my continuing education work. Every time I finish a webinar or class I open this file and write it down (I’ll be honest, I’ve missed a few). At the end of the year I’ll have a nice document with dates and times that I can use to write my annual report. I use Microsoft Notepad several times a day. In addition to its cool logging function I find it a dependable, simple text editor. Notepad is great for distraction-free, no-frills writing. If I have to copy and paste something from the web into a document—or from one document to another—and I don’t want to drag in all the formatting from the source I put the text in Notepad first. It cleans all the formatting off the text and lets me use it as I need. I use it as a quick way to create to-do lists or jot down notes while working on something else. It launches quickly and lets me get to work right away. Plus, if you delete all the text you’ve written—after you’re done working of course—you can close Notepad and there’s no dialog box asking if you want to save the file. Prior to becoming a librarian I worked as a programmer writing code. Every single coder I worked with used Notepad to create, revise, and edit code. Sure, you can work in the program you’re writing and your office’s text editor—and you often do; we used something like the vi text editor—but sometimes you need to think through your code and you can’t do that in an executable. I used to have several Notepad files of handy code so that I could reference it quickly without needing to search through source code for it. You can see the color highlighting that Notepad++ uses which is a great visual way to see if there are problems in your code without even reading it. It also features a document map which is a high-level view of your entire document on the right-hand side of the screen that highlights where you are in the code. There’s a function list that lists all the functions called in the file. Notepad++ has some other cool text editor functions like multi-editing (editing in several places in the file at the same time), and column mode editing (where you can select a column of text to edit instead of entire lines of code). It’s a very handy tool when you’re working on code. These are not the only text editors out there. A quick search for lists of text editors gives you more choices than you need. Notepad++ is at the top of several lists and I have to say that I like it better than others I’ve tried. The best thing is most of these text editors are free so they’re easy to try out and see what works for you. They all have very similar feature sets so it often comes down to the user interface. While these two options are Windows operating system only, there are plenty of good text editors for Mac users, too. Text editors won’t be the starting point for my coding program. We’ll focus on some non-tech coding exercises and some online tools like Scratch or Tynker and some physical items like Sphero or LEGO Mindstorm. While these are geared towards children they are great for adults who have never interacted with code. (Sphero and Mindstorm do have a cost associated with them) When I get to the point in our coding program where I want to talk about text editors I’ll focus on Notepad and Notepad++ but let people know there are other options. If I know my patrons, they’ll have suggestions for me. Do you have any cool tips for your favorite text editor or perhaps just a recommendation? 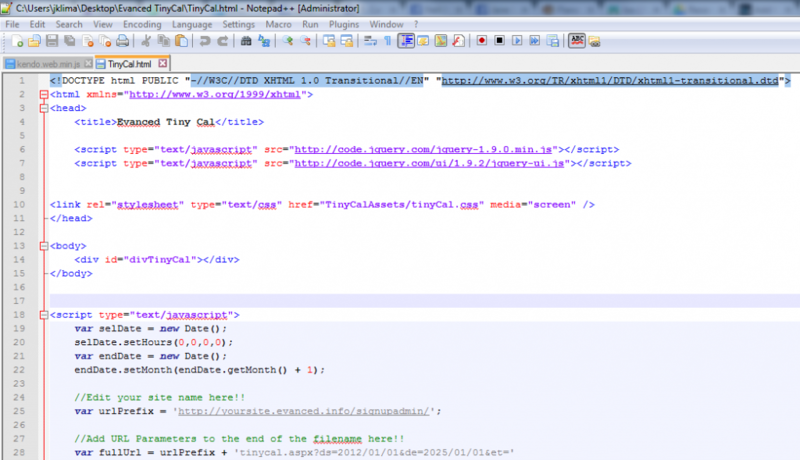 General information coding, Notepad, Text Editor. permalink.